March is Women's History month and the theme this year, according to the National Women's History Project site is "Celebrating Women's Character, Courage, and Commitment." This blog highlights an often overlooked 19th century woman for her significant contributions to religion and health. Her strength of character, courage and commitment are evident in the body of work she accomplished. 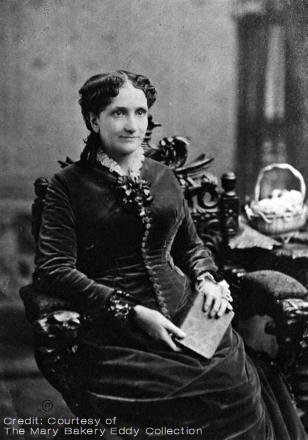 Mary Baker Eddy was no ordinary woman. Behind her Victorian-era velvet and lace dress was a 21st century power suit. At a time when women could not vote, rarely preached from a pulpit or took part in medical professions, her work in the healthcare arena broke through the glass ceiling that had yet to become a metaphor. Eddy's ideas as an author, pastor, teacher, and healer charted the path for current thought on consciousness and health today. And in more ways than one, they still lead the way. After a series of disappointments, including the passing of her first husband and the eventual desertion of her second, Eddy was mid-life and suffering from her own chronic ill-health. This prompted her to investigate alternative healthcare methods, rather than resorting to the harsh treatments and side-effects of conventional 19th-century medicine. She tried diets, hydropathy, homeopathy and what are now known as placebo treatments -- and she found some relief. But her most important conclusion from all of her investigations was that what a patient believes is directly related to the healing results they see. It was a nearly fatal experience in February of 1866 that pushed her one step further in her investigations. A fall on the ice that resulted in internal injuries left her lying in her home with her doctor, family, and friends counting the hours. Deeply religious, and with nowhere else to turn, Eddy opened her Bible to one of Jesus' healings. Instead of dying, she recovered almost immediately, much to her doctor's disbelief. And she was left wondering just what exactly had happened. She spent the next nine years looking for answers. She named her discovery Christian Science and began teaching others how to heal as well. And she followed through on Dr. Davis' advice to write a book. Science and Health with Key to the Scriptures became an international best-seller and a leading source on the subject of consciousness, spirituality, and health.